Lake Compounce, New England’s Family Theme Park, has big news for 2018! Lake Compounce is offering special Black Friday deals and discounts available for a limited time including the return of the All Season Dining Pass! New for 2018 includes the Preschool Play Pass giving FREE admission for kids 4 – 5! The new Preschool Play Pass gives children ages 4 - 5 years old FREE admission during the 2018 season! A parent or guardian must register their 4 - 5 year old online before March 31st by completing the online registration form. An adult season pass must be purchased at the time of online registration for the Preschool Play Pass. Proof of age (birth certificate or travel passport) must be shown at the park between May 5th and June 3rd in order to activate the pass. As always, children 0-3 years old are allowed in free and do not require a pass. Back by popular demand, the All Season Dining Pass will return for 2018! All season passholders will have the option to add the Dining Pass to their season pass. The Dining Pass entitles guests to receive 2 meals and 1 snack every day they visit during the summer season for only $79.99 during the Black Friday Sale! 2018 Platinum Season Pass – Just $59.99! 2018 Diamond Season Pass – Just $89.99! 1 day Regular Admission Ticket – 50% OFF! Although soda will no longer be free for all guests, all Diamond and Platinum season passholders will continue to receive free fountain Pepsi products. Diamond and Platinum season pass holders will receive great perks including bring a buddy free days, early waterpark admission days, discounts on all food and retail purchases, and so much more! To take advantage of these Black Friday sales, please visit http://www.lakecompounce.com. Lake Compounce is the oldest continuously operating amusement park in North America, celebrating its 172nd season in 2018. 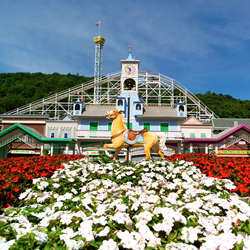 Lake Compounce is home to the number one wooden roller coaster in the world, Boulder Dash, and the largest waterpark in Connecticut!